Yosemite's new Handoff and Continuity features are pretty amazing. 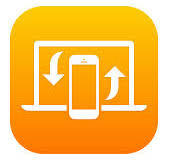 This includes making phone calls, picking up where you left off in apps on other Apple devices seamlessly. Unfortunately even the latest USB Bluetooth 4.0 dongles aren't working at all with this feature. Fortunately there are solutions available that make these features work 100%. 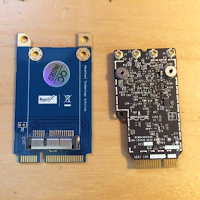 The best way to get Handoff and Continuity features activated is using a native Apple mini networking card from a real 2013/2014 Mac with a specially modified PCIe or mini-PCIe Adapter. I've put a few of these together, and confirm that they work really well. 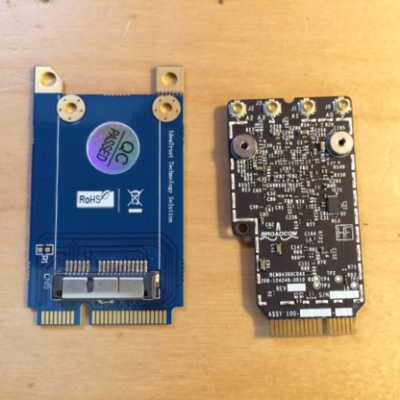 The first one I made was using an older MacBook Air card with the PCIe adapter. It connects both to PCIe slot and to USB hub on the motherboard. The MacBook card only had 2 antenna pins which were too small and too few for the 4 antenna PCIe adapter. I ended up ordering a iMac card which fit perfectly with PCIe adapter's 4 antenna pins. Both cards work fine with the mini-PCIe adapter as well- however you need to make sure your motherboard (I used an ITX with built in mini-PCIe slot) is fully bluetooth powered. If I were to do it again, I'd get the iMac card first, but both cards are identical Broadcom chipsets. 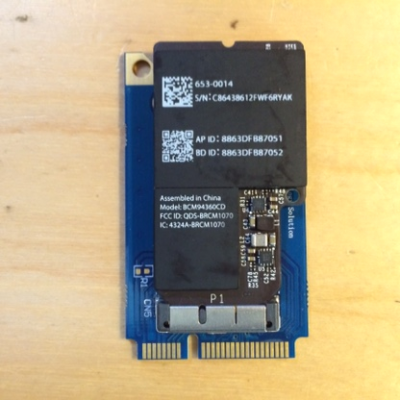 The following screenshots show how the card shows up on a CustoMac. 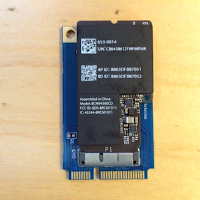 It's a fully native Broadcom BCM43xx wifi with BRCM20702 Bluetooth USB hub. You can find the adapters and cards readily available on Amazon or eBay, usually shipping from China. This method provides the best cost savings- I was able to make a full unit for under $50. 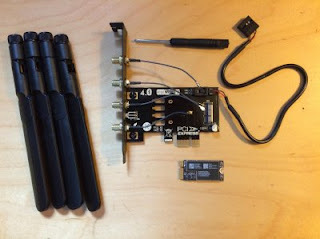 In addition the website osxwifi.com sells the full package- no assembly required. This method costs extra because of the convenience and assurance that the right parts are ordered. 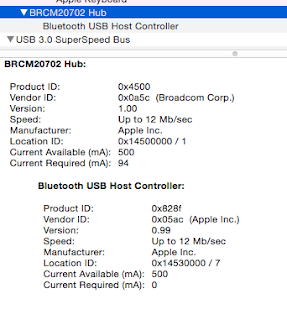 Continuity Activation Tool is an open source script to get Continuity working with some older Macs built in Bluetooth module- this could also work with some Bluetooth 3.0 cards. Check out Github for the latest download of Continuity Activation Tool. Unfortunately this doesn't enable 3rd party USB Bluetooth devices though such as the IOGear Bluetooth dongle. EDIT: Continuity Activation Tool 2.0 works with some Bluetooth 4.0 USB dongles. 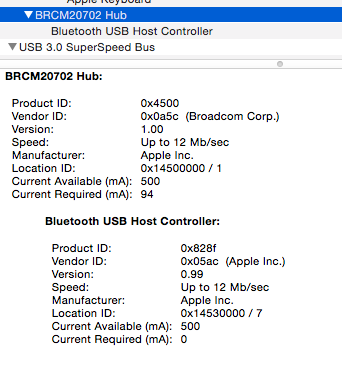 If you've ordered or enabled a specific card or adapter, this thread is to list all working and functional WIFI/BT adapters which work with Handoff and Continuity features in OS X Yosemite. Please provide as much detail as possible including model numbers, photos, and screenshots when listing your card and adapter. Thanks!